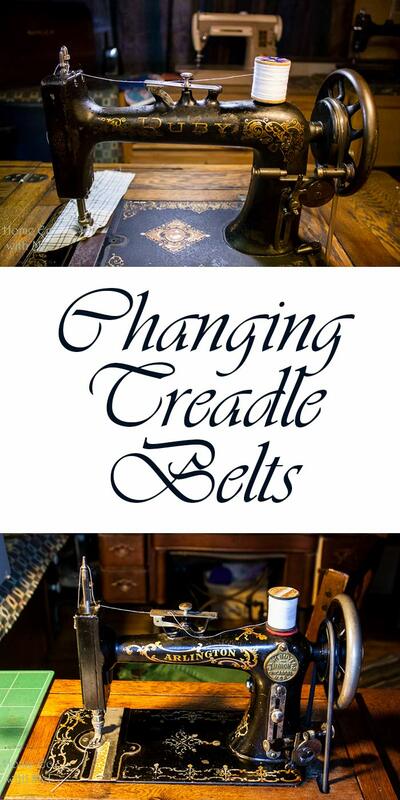 Hello everyone, today we are going to talk about treadle sewing machine belts. We will discuss the process we undergo when replacing a worn or broken leather belt. I will also share a few improvised belt ideas we have found to be successful replacements when a leather belt was not available. Or when the intention is to utilize one set of irons for a variety of sewing machine heads. The sewing heads could be changed out periodically to accommodate special needs or just to satisfy the desire of trying something different. 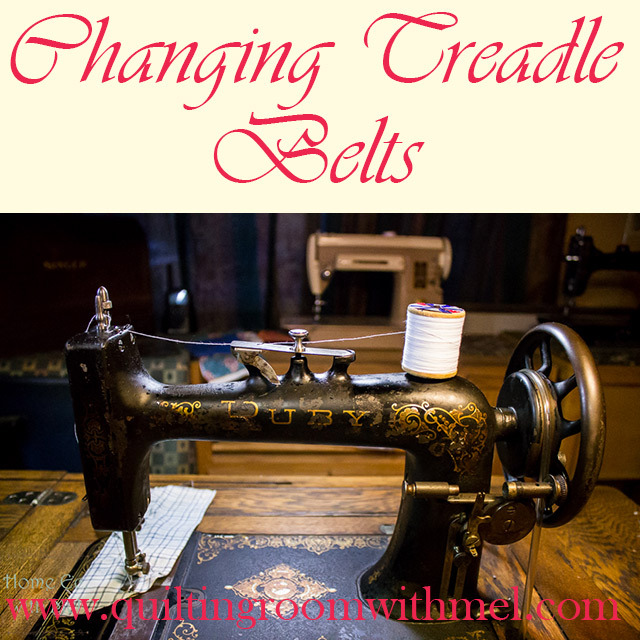 I will start of course with the Treadle sewing machines not only because treadling is my favorite way to sew but also because history seems to point them as being the first sewing machine to utilize a belt. The first treadle machines used a leather belt to transfer motion from a rocker style foot peddle pushing a large diameter drive wheel, to the hand wheel of the sewing machine. By rocking the peddle the belt would make the hand wheel rotate turning the crankshaft of the sewing machine and driving the needle up and down while at the same time sliding a shuttle containing the bobbin back and forth thru a loop created in the thread carried by the needle forming a locking stitch. OK, Ok I know the historians amongst us will be ready to shoot me because the first machines were known as chain stitch machines and only needed one spool of thread to form its stitch. The truth is I don’t have a chain stitch machine (YET) and I don’t know for sure exactly how they form the stitch. Someday opportunity and finances will intersect in the galaxy and I will own a chain stitch treadle, but until then I can only dream and wait. Back on topic. Leather belts at the time were round strips of leather about 3 times the diameter of a bootlace or larger. I have belts that range from 3/16 inch to 3/8 of an inch in diameter. Most machines don’t care exactly what diameter the belt is as long as it will clear the belt guards of the machine and it fills the groove in the pulley. The belts get their gripping strength for turning the pulley from the sides of the groove and not from the flat bottom of it. So by design, the belt only has to be tight enough to keep from slipping. Over tightening it will cause excessive drag on the bearing surfaces causing them to turn hard which means the pedal is hard to push and the bearings and shafts are subject to excessive wear issues. Unfortunately, tension adjustment for a treadle machine means the belt is stretching over time and is now too long or it means a belt has worn over the years and dry rot has caused the belt to break. The solution is to replace the belt or if it is just too long then it can be taken loose and cut down just a bit and reconnected. So we will approach this as if we are putting on a brand new belt. Commercially acquired belts usually come pre-packaged as a kit containing roughly 60 inches of belt with a steel staple through one end of the belt with the open end of the staple forming a hook. The belt is then threaded through the machine following the normal belt path, through all the guides and over both the drive pulley and the hand wheel pulley. I like to start the threading process from the top of my table so when the path is completed both ends of the belt are above the table top. I also like to pull my belt snug as I bring my ends together. With both ends now in my left hand lying side by side I can mark the end without the staple with a pencil or my thumb, even with the leather end containing the staple. I cut mine even with the curve in the hook part of the staple. After it has been cut to length the belt can be removed from the pulleys to gain room to work on the belt, or even removed completely from the treadle so a hole can be drilled or poked through the raw end of the belt. I pull the two cut ends of the leather together end to end with the hook overlapping the newly cut belt, mark the position for the new hole by using the curve of the hook part of the staple as a guide. The hole can either be drilled through with a tiny drill bit or it can be driven through using a small sharp nail or a large needle and a hammer. Once you have achieved a hole the next step is to thread the belt back through the machine. I find it easier to leave the belt off of the drive wheel during this process just like it would be if it was derailed on a folding top hideaway machine cabinet. Next, hook the end of the staple through the hole and bend it over with a pair of pliers. Now the belt can be rolled and stretched over the drive pulley and the job is finished. The belt will be a little tight at first but it will stretch with use and when it finishes its normal break in period it will more than likely not need to be cut again and shortened. If you feel it is too tight you can help the break-in period by massaging some leather treatment such as saddle soap or another leather conditioner into the belt to relax the pores of the leather and to soften it up. This technique is time-tested and history approved and it works very well if the noise of the staple clicking on the pulleys bothers you like it does me there are two different ways to eliminate it or at least tone it down to a reasonable annoyance. The easiest way is to squeeze the staple hard enough to make it bury itself into the leather a little so the leather acts as a buffer catching the sides of the pulley and keeping the clatter to a minimum. The second way requires the complete removal of the staple and using the holes to thread a heavy string through effectively sewing the ends together. When I sew the ends in this manner I offset three holes on each side of the two ends and then stair step the stitches across the joint going from one sides lowest hole to the other sides highest hole staggering each stitch until each set of holes have been sewn through twice. This is my preferred method of using a leather belt and ensuring it to be a silent running treadle machine. Sometimes when a new to me treadle comes to live at our house it will be missing a belt or the belt will be original since the turn of the century and it will be dry rotted and useless for anything more than memories. Being an impatient person I seldom wait to get a new leather belt, instead, I improvise and try new ideas using things we have around the house. I have tried extra-large O-rings actually gaskets for large chillers, cut to length and re-glued to fit the machine. The only problem I had with this style belt was my gasket material would only work on certain brands of machines and was too wide to fit between some of the belt guards. The next generation of alternative belt materials came in the form of airline tubing or oxygen tubing, depending upon whether it was used for fish tanks or oxygen for humans the tubing is basically the same. It is readily available in most hardware or medical supply stores and it requires no special glues or fasteners to hold the ends together. Once the length needed is established, to hold the ends together take a piece of tubing about 7/8 of an inch long from the left over the bulk piece you cut the belt from and cut it lengthwise down one side. The tubing will try to curl over its self. If you roll it tightly following the curve it will become semi-stiff like a paper stick for a child’s sucker. Shove the rolled end into the open ends of the tubing and the tubing becomes a band or belt. If you use a little alcohol to help encourage it to slip together the alcohol will evaporate and the coupling is almost impossible to remove. This works very well and it is extremely quiet in operation. But my favorite belt to use is the leg from a pair of ex-long nylons or thigh high tights. Cut the toe off and cut the thigh band off, thread it through the belt path of the machine. Overlap the two ends about an inch and sew the ends together either with a separate portable electric machine or by hand being sure to make several passes and secure the entire length of the one-inch overlap. Stretch it over the drive pulley and the hand wheel and treadle away. Super quick, quiet and easy to change machine heads when you want to. This has to be my favorite belt so far. When I started this post the intention was to cover vintage electric powered machines in this same post but as the story unfurled it became obvious that it would take more than one posting if I was going to go into depth with each section. So with that thought in mind and a humble apology, I will promise the next post will pick up with the electric machines. Until then keep the stitches in the fabric and not in the skin and enjoy your machines your way as often as you can. Great post, love your site! Thanks for this. I currently have a leather belt on my 66-1, but appreciate knowing there are other options! I'd love to see a post sometime about the rubber tires that go on the bobbin winders. The tire that came on my Singer 66-1 was very squishy and checked. I got a new one which is the right size but much firmer & I have to pedal furiously, the leather belt "slips" a lot & i have to help turn the wheel with my hand until the bobbin is about 3/4 full. Once it hits that point,it works normally - the belt no longer slips, it isn't hard to treadle & the bobbin quickly fills up. I'm guessing I need to make an adjustment, but am not sure what/where that should be.